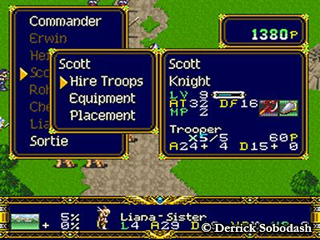 Translations: Der Langrisser Translation Released! 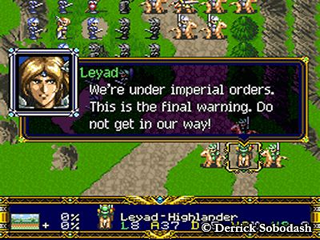 After 6 years in the making, the SNES Der Langrisser translation has been released. With 800K of script and 85K of assembly code, this project is a shining example of fan translations at their finest. It’s a showcase of talent for byuu, D, and the rest of the DLTeam. Re: Translations: Der Langrisser Translation Released! Hehe, kidding! Looking forward to trying this one. Looks great! Good job people! Der Langrisser is one of the greatest SNES games ever made. In my eyes, it's on par with Chrono Trigger's legendary status. If you are a gamer, then i strongly advice you to play this game. Version 1.01 has been released, which fixes the broken light path scenario. Sorry about that, apparently 26 beta testers were not enough to catch subtle bugs like entire scenarios being completely busted ... it fixes some other minor things, too. This will hopefully be the final version. I will be working on that article I promised, going over the history of the translation and the amount of work involved that really can't be appreciated unless one has played through the older WT / NLT patches. I'll post a link somewhere on this site when it's ready. EDIT: Nightcrawler, D asked me to refer you to a press kit he posted. We have prepared a small press kit for any news or fan sites interested in covering the Der Langrisser translation release. The graphics are released to the Public Domain, however, some of the content is not Public Domain, but appears as Fair Use under copyright law. If you are confused, read the license.text file included in the archive. It should give you better images to use for both the front page and the game entry in your database, as the ones up now are from 2003. I updated the entry page with new images and the new version. However, nothing was really suitable for the news update. The images are too big to run on the main page. I had tried out an auto resizing feature before, but the results were ugly. Thumbnails are also ugly, so we don't have those on the news. I could run some links instead, but it looks nicer with the images inline. I hate to keep nitpicking, but the page is somewhat outdated. Spinner 8 mentions somewhat of the issue with SNES9x, but the issue also occurs in ZSNES. You may wish to copy/paste our warning, or make your own. But we should probably warn against using ZSNES here, too, as people hate to read. The more places the warning is visible, the better. We intentionally decided not to put the warning in the ROM itself, because that's just really unprofessional, and obviously if ZSNES9x ever do fix their issues, it would be a shame for that warning to still be there. I hope ZSNES9x will fix the bug and we can remove the warning soon. I'm very hopeful of the new ZSNES sound core. Next, the text at the bottom ... the scenario 27 bug has been fixed with v1.01, so I don't think the warning is needed anymore. Finally, assuming no major issues like the sc27 bug pop up, we are planning one last final release. It will be in a few months, and will be in our new patching format. After that, no bug reports will be accepted, no matter how major. If you'd like, I can attempt to edit it myself. I don't know if I have the priveleges needed to do that, or if it's wide open like a wiki. Thanks for updating so quickly, by the way. I appreciate it. Right. Feel free to nitpick away and make whatever changes you need to. That's the point. It's everyone's responsibility to keep things up to date. I noticed those Edit links before but I was always afraid to click on them. Just added a little note for my Zelda: Master Quest hack! There's lot's of hard work and love poured into this translation! The manual is pretty helpful too (I regret reading it only after starting the 3rd scenario), although I think it contains some spoilers (on the enemy characters pages, so skip those if you can). Very nice. I reworded your last two sentences slightly. Hope you don't mind. The lines about the translation should be removed. Its' a Game Review. It'll be attached anywhere that game is used. I'm very sorry about that, I chose not to write out SRAM files on write, it causes a lot of issues, too. What if I save in the middle of a SRAM update? If I save on every single write you'll end up getting ~8,000 file writes a second, infinitely more in games that use SRAM as added scratch RAM. But if I save every few minutes, you'll almost certainly end up getting a "half updated" SRAM file that will not be usable anyway. Alternatively, I hear SNESGT works pretty good with DL. No lockups reported at all, yet. How about a button like in Zsnes with which you can save SRAM on click?